We humans enjoy breaking things up and dividing them with sharp lines, day night, black and white but these are arbitrary lines we etch upon the reality of the thing. 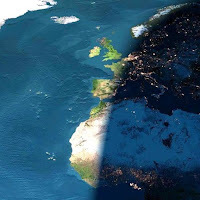 There is no line between day and night; no sharp terminus moving from east to west at 733 miles an hour as observed from space. We slide into night slowly, the sun's light fading away until no light bends around the curve of the earth by illuminating the atmosphere with faint stray rays alighting upon stratospheric clouds. The true night comes when the sun dips eighteen degrees below the horizon, then it can get no darker. So too it is with winter, it slides in upon us. We can come up with dates on a calendar we can draw our little lines but they are merely milestone to mark the passing of time. They are hours on a clock that bring us comfort and order but they are meaningless when we stand alone in the woods confronted by the reality of seasons. This morning it became winter to me. We've been sliding toward it, the shadows growing long for months now. I've seen snowflakes in the skies here and there for more than a week now but it still was not winter, I could not feel it, I could not hear it and I could not taste it. This morning though it was winter. I stood in the woods and I heard the wind blowing a lonely sound. There was not the familiar soft flutter of quaking aspen, there was not the warm breeze upon my face. A cold moan drove through the trees with a breathed whisper, a cold stinging white noise putting the world to sleep. In the fall there was a crackle of life left, autumnal discussions between leaves and wind. It is gone now, replaced by a cold monotone meditative drone. The trees do talk some but only a talk of cold. On this day, a solitary oak sounds out in the forest as it creaks with a lonesome song as it moves hundreds of years worth of fibers in the wind. These same trees creak in the summer but it somehow sounds different now. Lonelier and plaintive. Gone are the bird sounds of summer. I am greeted by the solitary woodpecker who's call sounds otherworldly borne on the cold dense winter air. The call is brief, mechanical and to the point. There is no time, no energy for the bird songs that float almost languidly though the verdant green summer woods where time seems to stretch on forever. We have crossed the imagined line. I suppose it happened during the night. One day it feels like fall and the next like winter. There are only hints of snow on the ground, pockets of fluffy water, it too is sleeping, unable to move on its own. It must obey the wind and in doing so it betrays the serpentine movements of the wind across the land. The heavy cold air moved from the north to me, it dances about my feet in spirals as if examining this bit of warmth in a cold land. It steals what heat it can then moves on. I can feel the feeble heat of the sun as it tries to warm my face. It holds power still but every day it has lost some grip. It will not gain the upper hand for yet another month at the winter solstice but just as it took months to wring and wrest the heat from the land it will take months to bring it back. I will bide my time, I will wrap up in layer upon layer, trapping heat in insulative pockets of warmth against my skin and I will keep the wind from tearing loose my hard fought warmth stored away from summer. I will bring the sun's heat out from the core of the trees where it was transformed decades ago into fiber. I will let it burn in the fireplace while I sit on the hearth and feel the heat of the sun once again. I will venture out into this cold land and explore it as though it as the new and wondrous world that it is. A new planet has appeared out my door. I don my space suit and explore, discover, revel in my warm core as I see the transformed and transformative sometimes blinding beauty of crystalline water. I will howl at the sun dogs in the sky who watch over me in the day and I will remove my layers one by one as I slide closer and closer to an imaginary line that I will someday step over and find myself in spring.